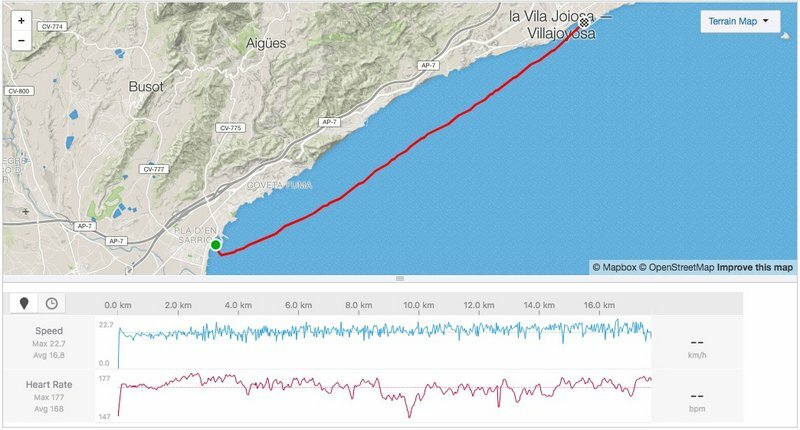 With a good 20kt forecast WSW wind, there was no doubt which course the organisers would chose: Start on the beach at El Campello, 500m out to sea to a buoy, turn 90 degrees left and head 17km straight downwind to the finish in the harbour entrance at La Vila Joyosa. The event had declared a two-day waiting period with a lifesaving-style knockout event scheduled for the “other” day. Race Director Antoine Ferrer chose to run the main event on Sunday to ensure the best possible downwind conditions. “The lifesaving event was great fun,” said Sean Rice. “Perfect for getting on the water and loosening up a bit. 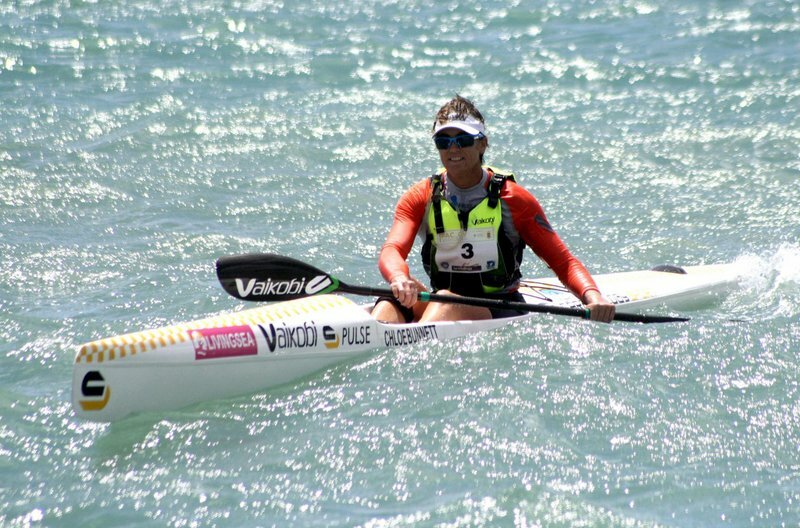 The race threw a bit of prizemoney at it too, and all the top paddlers took part.” Esteban Medina (Spain) won the men’s final with Jenna Ward (South Africa) winning the women’s race. 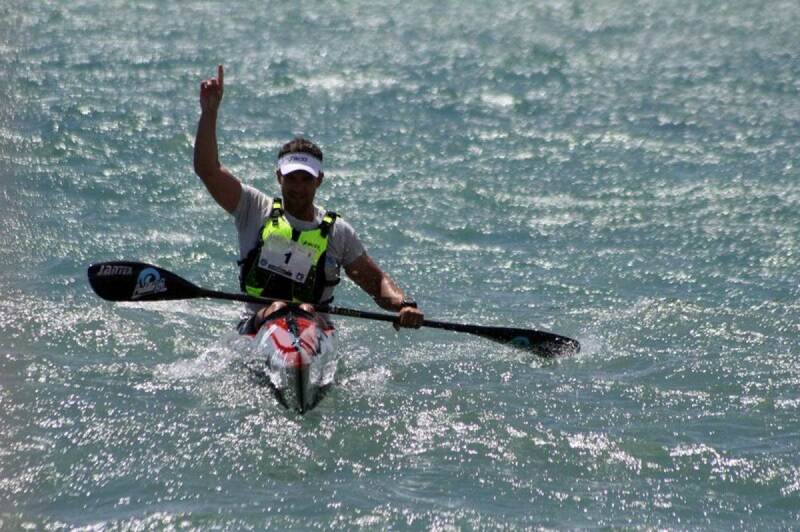 The day of the main race dawned, the paddlers checked their boats on the trailers, picked up and activated their tracking units and made their way to the buses to be transported to El Campello. “I’ve won this race before,” said Chloë Bunnett, “but this time we had real opposition!” Top Spanish athletes including Judit Vergés Xifra, Amaia Osabo Olaberri and Aurora Figueras Palomeras were lined up, as well as South African Jenna Ward. She had her GPS showing 1km splits, which told her how well she was progressing. “It was really exciting: the splits were great, and I knew if I could keep it up, it would be tough for anyone to overtake me,” she said. Having paddled the course many times before, she knew exactly where she was and which line she wanted to take into the finish. By then the wind and waves had both strengthened and she concentrated on achieving her best splits over the final 2-3km. “It was my fastest average speed in a race ever,” she commented. But when she arrived at the finish, there was a problem. When she asked where she’d come, the reply was, “oh, you’re definitely in the top 40!” Not what she wanted to know… and in the turmoil of wind, waves and skis, it was another 20 minutes before she found someone to confirm that she had in fact won the women’s race!